Back in this article I mentioned that on our way north last spring we had another occurrence of broken turbo studs. It had happened about a year before up in Juneau, and we thought we had the problem licked, but apparently not. When the studs crack, the seal between the exhaust manifold and turbo is compromised, and because both the manifold and turbo are cooled by engine coolant, it all starts leaking out. Sooner or later this completely disables the engine because without enough coolant, it will overheat. Fortunately both times it happened we were on our way to port, and made it in without overheating. Below you can see the exterior evidence of the failure. The yellow stuff is coolant. You can also see the vertical brace installed last year to help take the weight of the exhaust off the turbo. It may have helped, but clearly wasn't a complete solution. 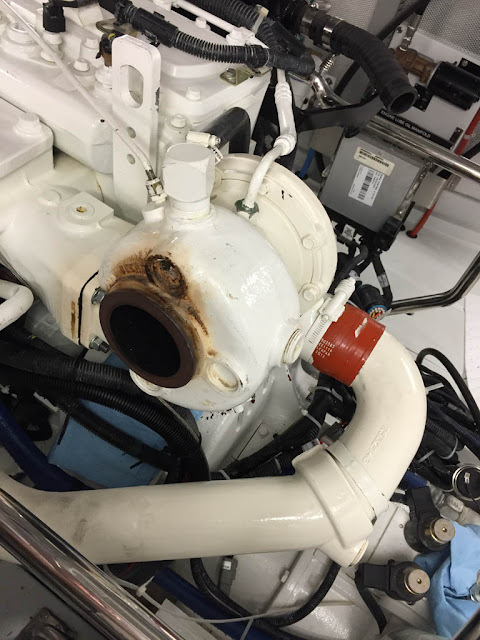 In the picture below, once the turbo has been removed you can see the two upper studs have parted. The one on the left broke leaving a good stub to grab onto to remove the stud. But the one on the right broke off about 1/2 thread inside the manifold, so I had to drill it and use a bolt extractor to get it out. You can also see the coolant passages. The center opening is the exhaust passage, and the oblong openings above and below are the coolant passages. Since the exact same thing happened again despite installation of a support brace after the first occurrence, further investigation was clearly warranted. One common factor is that leading up to both failures, we were running the boat pretty hard - on the order of 2000 RPM out of a max of 2200. This is absolutely fine - the engine is rated for 24x7x365 operation at 2100 RPM, and up to full 2200 RPM 16 out of every 24 hrs. - but it's different from our normal cruising at 1600-1900 RPM. To make a long story short, the picture below will show what's happening. The tall structure circled in red is rigidly attached to the turbo. Because it's rigidly attached, when the engine vibrates, the exhaust structure has to vibrate with it. But the structure has a very long lever arm, so requires lots of force to make it move along with the engine. It's like holding a baseball bat and trying to shake it around. If you hold it in the middle where it's center of mass is located, it's not real hard to shake it back and forth. But if you hold it from the handle end, now the center of mass is out maybe 2' from your hand and it's much harder to shake it back and forth. That's what's happening with this exhaust structure, except instead of weighing 2 lbs like a baseball bat, this structure weights over 30 lbs. Trying to move it in time with the engine vibrations simply overwhelms the turbo mount and breaks the studs. After talking with a number of people, I decided to pursue a two part solution. 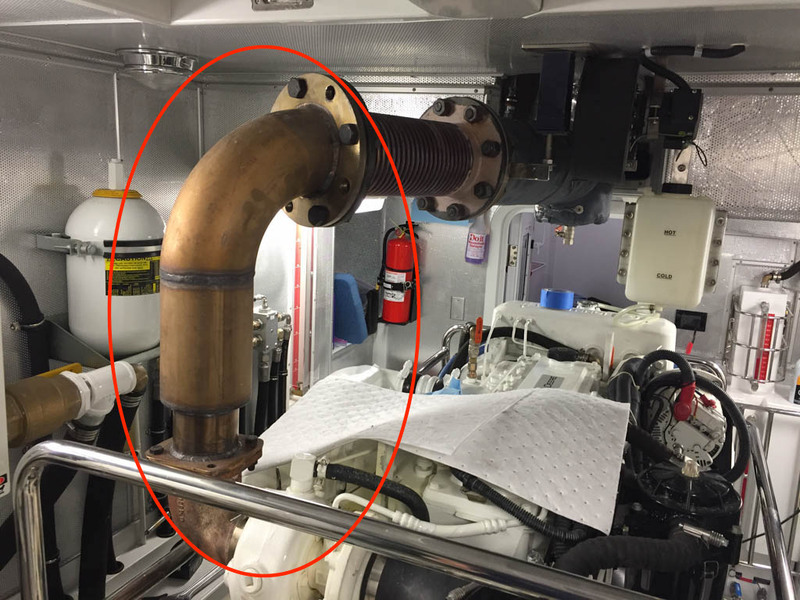 The first, and most important part, was to install flex piping in the vertical exhaust section. Doing so would reduce the mass directly attached to the turbo, and decouple any engine vibrations from the rest of the exhaust structure. The second part was to add a new set of spring hangers over the big flange to carry the weight of the exhaust over the turbo. Ideally the exhaust structure should mate with the turbo elbow, but exert no pressure on it in any direction. It should just float above it. I probably could have ordered parts and gotten all this done in Port McNeill, but we didn't want to lose any more time than necessary, so I decided to haul everything down to Seattle in a rental car, get the work done there where I knew the people and places, then come back and install it. So I removed all the insulation blankets, that exhaust riser, and the turbo. Got a rental car, and drove for 10 hrs including a ferry crossing and boarder crossing to get back to Seattle. 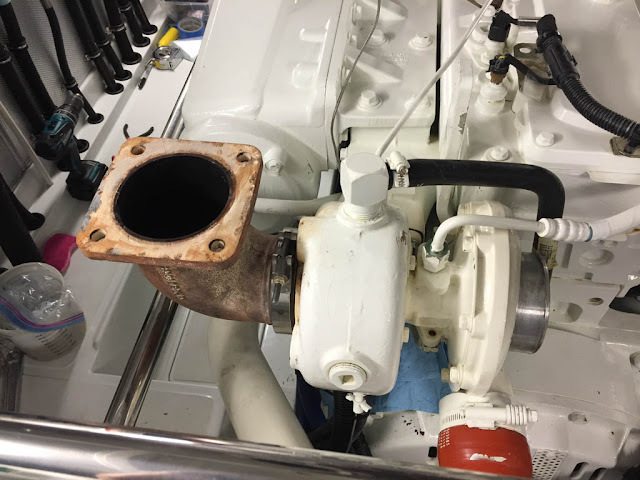 I had lined up Hatton Marine to do the exhaust modification, and they started working on it before I even left Port McNeill. They also pulled and ordered all the parts that I would need for reassembly. And I lined up Ballard Insulation to modify and/or make new insulation blankets as needed to fit around the modified exhaust, and around the new mounting brackets for the hangers. The next morning I was at Hatton at 7:00, dropped off the exhaust structure, picked up the parts, then went to visit some friends while I waited. Hatton finished early in the afternoon, and I hauled everything over to Ballard Insulation for them to work on. By 3:00, everything was done and I was back in the car on my way north with plans to stay the night in Nanaimo, and continue on to Port McNeill in the AM. Below is the modified exhaust riser with attached mounting brackets to connect to the hangers. And note the buckets of coolant. It's about 12-13 gallons that has to be drained out to do this job. After arriving back in Port McNeill, I spent the next two days putting everything back together again. First, the turbo goes back on along with the oil deliver and return pipes, the compressed air pipe, coolant return, and the vent pipe. Oh, and don't forget new mounting studs and nuts. Then the turbo elbow gets installed. 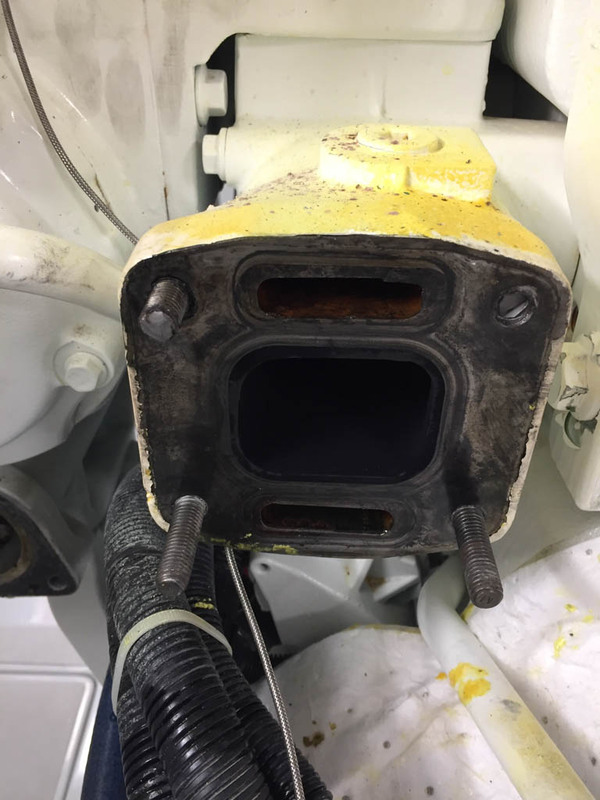 It's easier to attach the elbow to the turbo and ensure a good fit, then align the rest of the exhaust to just float over and kiss the square flange that you see below. And fast forward to installed hangers and fitted exhaust section. Once everything is in place, the spring hangers can be adjusted and the various joints rotated to get everything perfectly aligned, and with no weight on the turbo flange. Here's a video overview of the modification, also showing how the mating flange should float freely over the turbo elbow. One obvious question is why, after building 60 of these boats, am I now having this failure? I think the two pictures below say it all. The first picture is of a friends earlier vintage N60. His boat, and pretty much the entire N55/N60 fleet were built with the Deere 6081 engine. The engine and turbo stand taller, with a resulting shorter exhaust riser. Compare that to the next picture of my boat with the newer Deere 6090, introduced to meet EPA Tier II regulations. The engine sits noticeably lower, resulting in a significantly taller exhaust riser. This larger structure apparently is just enough to overwhelm the turbo, where the older arrangement was fine. So that was our major repair last spring. But to be sure you don't go away thinking that I do nothing other than fix things on this boat, I have come up with a new benchmark for measuring a boat's condition. You judge based on how quickly you run to the hardware store or marine supply store when you arrive in port. 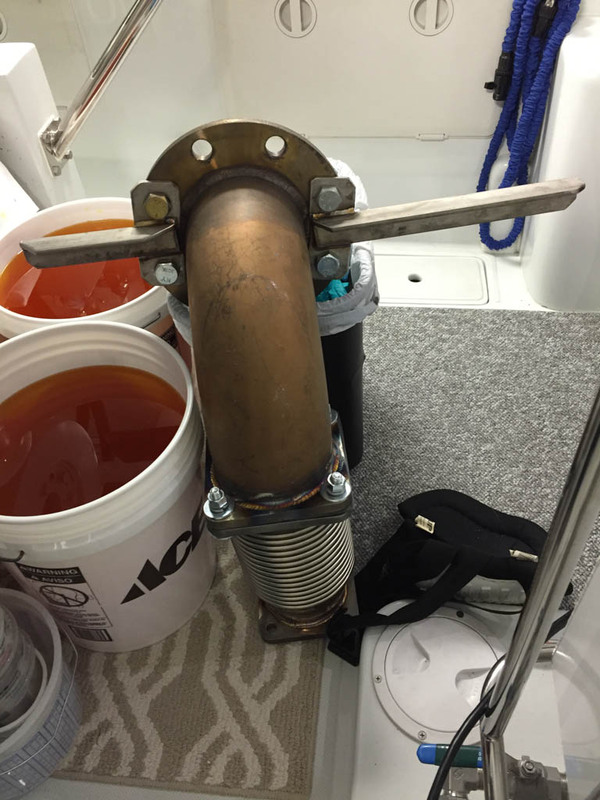 The faster you run, and the more you buy, the more trouble you are having with your boat. I'm very pleased to report that after this repair, and for the rest of the summer, I did not make a single purchase at a hardware store or marine supply store. Based on that, I'd say the boat is running pretty darn well. 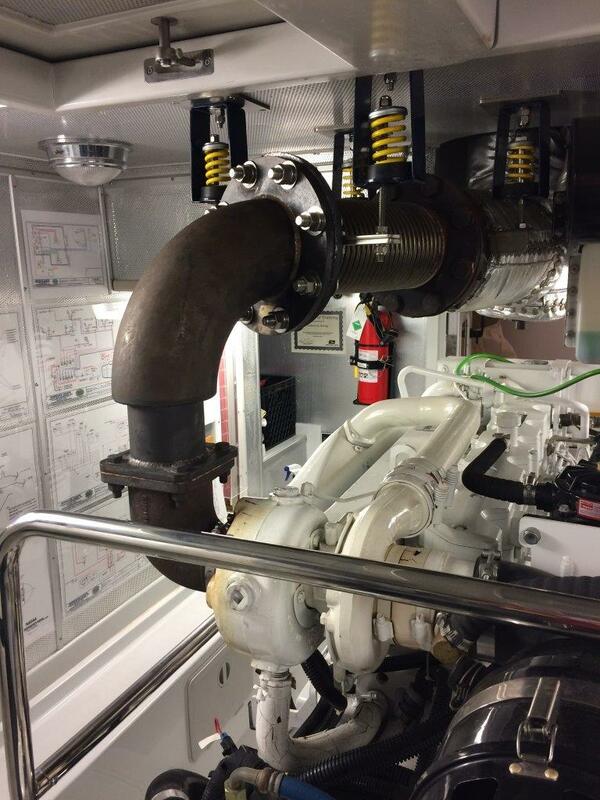 Like many boats, our main engine is equipped with two alternators. One smaller 85A unit charges the starter battery, and one larger 190A unit charges the house battery. Ours also came equipped with Balmar smart regulators controlling each alternator to provide 3-stage battery charging for each battery bank. This is a good setup, and worked fine, but for a handful of reasons I wanted to make some changes. The first motivation to make changes was because the 85A start battery alternator was getting very little use. Under normal conditions, an engine start battery doesn't get used very much. When you run the starter, it draws a huge amount of current, but the engine typically starts within a few seconds, so the total amount of power draw out of the battery is very small. As a result, it takes very little time to recharge it, after which the alternator is just spinning and producing little to no power. That's 85A of potential charge power sitting idle, and meanwhile the house alternator is running full tilt for hours on end recharging the house battery after a day and night at anchor. So I wanted to use that alternator to help re-charge my house battery faster while under way. The second motivation is that I also had plans to add 240V inverter service on the boat so we could do laundry while under way. This will be the subject of another article. Up until now we had to run the generator, which works, but with only the washer and drier running, it was a very light load for our 20kw generator. So running off the main engine alternator(s) via an inverter makes sense in the long run. All this led to the same conclusion; combine both alternators and direct them to the house battery, and charge the start battery some other way. The 190A alternator puts out a total of about 5kw, and the 85A unit puts out about 2.2kw. By combining them it's almost a 50% increase in charging capacity, and is a close match to my 7kw of inverter capacity. Problem 1: How to charge the start battery? If I take away the dedicated alternator charging the start battery and use it to charge the house battery, it's just a matter of time before the start battery would go dead. So I needed to come up with a new way to charge the start battery. The good news is that there are lots of ways to so it. The bad news is that you need to pick one and live with the trade-offs. If boats teach you nothing else, they do teach you about trade-offs. Here are the different approaches and the associated trade-offs as I see them. Options A: Parallel the start and house batteries while charging the house battery. There are a number of ways to do this, but they all have the same effect. When the house battery is getting charged, simply connect the start battery to the house battery and let it go along for the ride. - As long as the house and start battery are the same type, i.e. AGM, flooded acid, Gel Cells, the house and start battery will share the charge pretty well. - When on a shore charger, both batteries are maintained. This is important when leaving the boat for an extended time to compensate for self-discharge in the battery. - Doesn't work if you have different types of battery for house and start, e.g. flooded for one, and AGM for the other. They won't share the charge properly. - Even though the battery will share the charge, the charge cycle will be tailored to the house bank, not the start bank, and may not be all that good for the start battery. This is probably the biggest issue, and is most prominent with 3-stage chargers. Here's a good example of how it can be a problem. Say you are cruising, anchoring every night, and running for 4-6 hours each day. 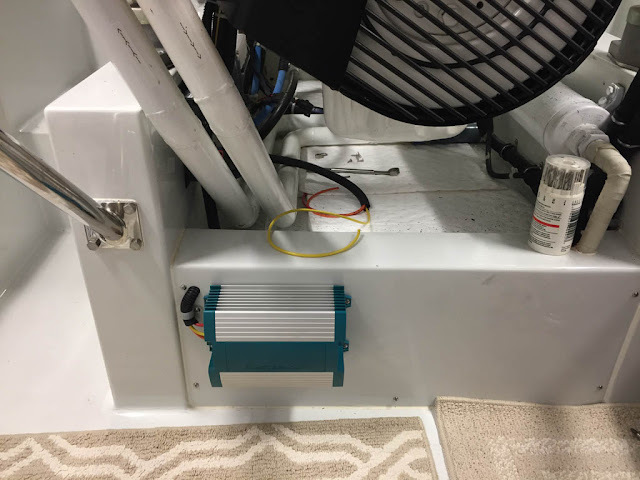 While at anchor your house battery gets drawn down, so the next day when you are underway your charging system will be operating at higher voltages for most of the cruise as it works to recharge your house battery. Meanwhile, your start battery only got a slight discharge when you started your engine, but because it's along for the ride as the house battery gets charged, it's going to be charged at a higher voltage all day when all it really needs is a relatively short recharge. As a result, your start battery ends up getting over charged. It won't be sudden death, but it likely won't last as long as it would if it were charged according to its needs rather than the house battery's needs. Lot's of devices are available to do this battery paralleling. Some support very high charge current, and some support lower current, but they all have the effect of sending the start battery along for the ride as the house battery gets charged according to its needs. The other approach is to connect a dedicated battery charger to the start battery. Ideally it would be DC powered by the house battery, and automatically switch on only when the house battery is being charged. If your house battery isn't being charged, you probably don't want the start battery charger to drain it down. - The start battery gets charged according to its needs rather than the needs of the house bank. This gives max life to the start battery. - The only power consumed is what's needed to recharge the start battery. - Start battery can be maintained at full charge while on shore power for extended periods of time. - Dedicated charger are generally more expensive than battery paralleling devices. I elected to use a battery charger to ensure that our start battery received a charge appropriate to its needs. Our cruising often involves the exact scenario that leads to over charging if you use some sort of combiner, so this seemed to make sense. I'm generally not a fan of Mastervolt. Their products are pretty good, but poorly documented, ignore the needs of North American split phase power (only really applies to their inverters), and have little to no tech support in the US. But in this case I picked them, and it's entirely because of what I consider to be a major flaw in the Balmar Duo Charger. The Duo Charger is limited to 30A, which is fine. But if the battery calls for more than 30A - say because you had to crank your engine a whole lot to get it started after changing the fuel filters - rather than limiting charge current to 30A and running for however long it takes to recharge the battery, the Duo Charger shuts down. It periodically starts up again and retries, but unless the Battery Charging Fairy came and recharged your battery in the mean time, there will still be a call for more than 30A and it will shut down again, over and over, and never recharge your battery. They do have a provision for an external bypass relay. But it's manually operated, so no better than the manual battery parallel switch that I already have. So I consider this to be a major design flaw, and instead used the Mastervolt Magic 24/24-20 which is a 24V to 24V, 20A 3-stage charger. It works well, recharges the start battery quickly, then maintains it at a comfortable float voltage for the rest of the time. Now, with an alternate way to charge the start battery, I was free to move on to part 2 of the problem - how to parallel the two alternators. How you regulate multiple alternators depends greatly on how the alternators, engines, and batteries are set up. The alternators can be on the same engine or on different engines. 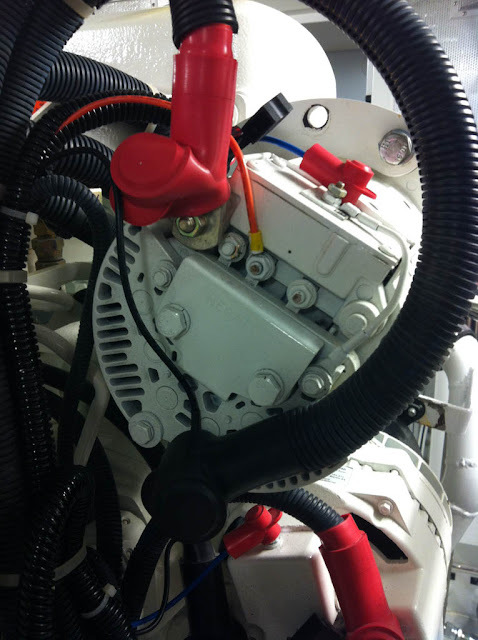 And the alternators can be connected to the same battery bank, or different battery banks. Unless they are on the same engine, and connected to the same battery bank, the alternators need to be individually regulated. 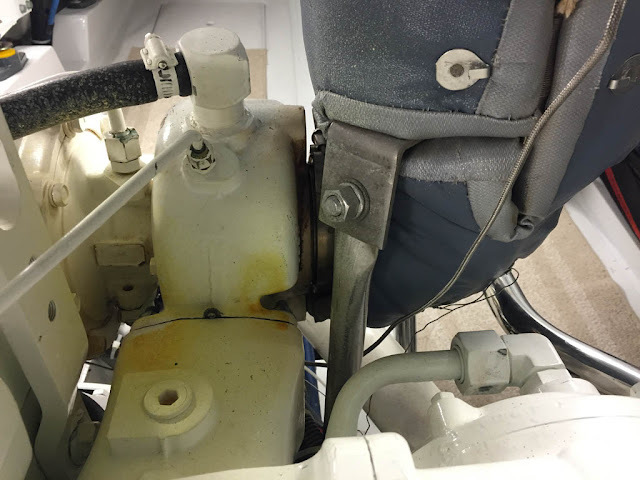 This was the case originally on my boat where the two alternators were on the same engine, but connected to different battery banks. As a result, each had its own Balmar regulator. But with the reconfiguration, both alternators would now be connected to the same battery bank, making it possible to regulate with a single regulator. It's still fine to regulate the alternators individually, just not required. Some friends on MV Dirona elected to regulate them separately as described in this article. I decided to regulate them off of a single regulator for two simple reasons. First, I could stash the second now-unused regulator away as a spare in case the other failed. Second, I wouldn't have to worry about balancing the alternator outputs since they are self-balancing with a single regulator. You might be wondering how this self-balancing works. If not, skip ahead. But it's really pretty simple. 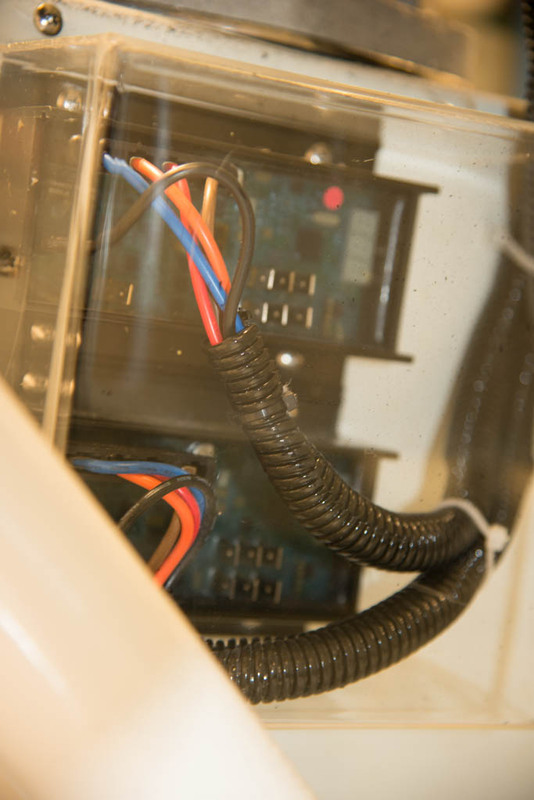 The Field terminal on the alternator controls its output. If you apply 0 volts to the Field terminal, you get zero output. If you apply full battery voltage to the field terminal, you get full rated output. And it's proportional in between. The regulator controls the alternators by varying the Field voltage. So if the regulator applies half voltage to the Field terminal, each alternator will put out half of it's rated current. That means the big alternator will put out 95A, and the small one will put out 42A. Each is always doing it's proportional amount of work. It works really well, but does require that they be driven by the same engine, and be connected to the same battery. Rewiring was actually very easy. All I did was move the small alternator's output over to the big alternator's output, connecting them together right at the current shunt that measures the big alternator output current. Wired this way, the pilot house meter shows the combined current of the two alternators. I also had to up-size a couple of fuses from 200A to 300A to handle the extra charge current. Fortunately the cables carrying all this current were already oversized (4/0), so capable of carrying the increased power with only about 0.7% voltage drop. This is probably a good place for a little caution. It's really important to check the entire wire run from the alternator to the battery to be sure all the intervening wires are sized to handle any increased current. And this includes checking the ground path as well as the positive path. Electrical fires are not a good thing. And also recalculate the voltage drop. 3% would be the max, and even that is a bit much when you are working with charge voltages where 0.1V can be significant. Next, I removed the now-unused second Balmar regulator and stashed that in the spare parts bin, and jumpered the field connection between the two alternators. Another lesson in boating it to always expect the unexpected, and guess what.... This was no exception. Initial testing was not producing the expected current out of the smaller alternator. But why? While poking around, I noticed something odd on the small alternator. 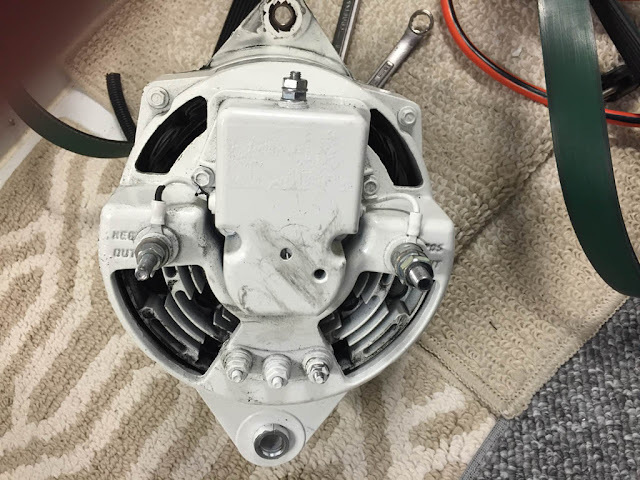 In the picture below, the box on the back of the alternator has two wires coming out of it connected to the positive and negative posts. That's the way built-in fixed voltage regulators are set up. And you see the two small holes in the box? That's where you would reach in with a small screw driver to adjust the fixed charged voltage. This alternator looks like it has an internal regulator rather than using an external regulator. I sent this picture to Balmar and after a bunch of head scratching they agreed that this alternator was equipped with an internal regulator, even though the alternator part number was for an externally regulated model. So my start alternator was internally regulated, even though it was wired to an external regulator that was actually doing nothing more than turning on the internal regulator. How messed up is that? 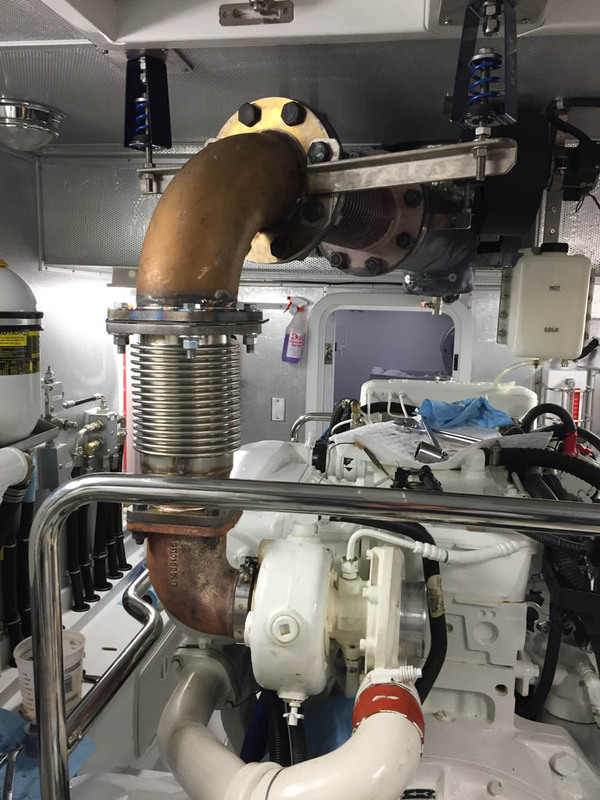 It's unclear where this mix-up occurred between Balmar (supplier of the alternator and regulator) and Cascade (supplier of the packaged engine and charging system), but at this point it doesn't really matter. Fortunately Balmar was only about a 45 minute drive away, so I packed up the alternator and took it to them, and they swapped out the internal regulator box for a box wired for external regulation. Once reinstalled, testing now showed it working exactly as expected with each alternator putting out its portion of the charge current across different loads. And I now have a whopping 275 of charging current to get our house battery up to full charge between anchorages. And when the charge loads are more modest, the work is shared between the two alternators rather than concentrated on one while the other loafs around doing nothing. Wow, that ended up being a much longer article than I expected, but hopefully it will help others who are evaluating alternative charging systems.